Los Angeles returned Alex Verdugo to Triple-A Oklahoma City so he could play every day. Lately, he's making the most of his playing time. 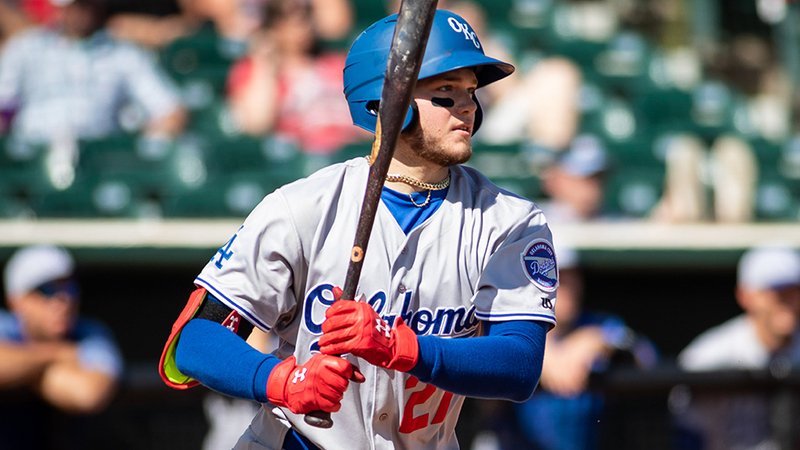 The top Dodgers prospect posted his third three-hit effort in four games, going 3-for-4 with an RBI in Oklahoma City's 4-2 win over Fresno on Saturday at Chukchansi Park. MLB.com's No. 28 overall prospect earned a brief Major League callup in late April and batted .265/.306/.382 with four doubles in 37 plate appearances with Los Angeles. But he was sent down once Yasiel Puig returned from the disabled list on May 9. "Alex came up and played well for us, played with some energy," Dodgers manager Dave Roberts told the Orange County Register last month. "He's obviously a part of what we're going to be doing. He came up because of an injury. Once Yasiel came back, to get Alex back down there playing makes sense. "With Alex, you want a guy like him if he is here to be playing every day, not just to be a bat off the bench. Even if it's just being here for another five days, that's another 20-something at-bats down there, and if we need him we can recall him." Verdugo has been a menace since returning to the Pacific Coast League, hitting .381 with five doubles and seven RBIs in 18 games since May 12. The left-handed hitter poked a single through the left side of the infield to plate Andrew Toles in the first inning, then punched a single to his pullside in his next at-bat leading off the fourth. Verdugo completed another three-hit night by lining a single up the middle in the sixth. All three hits came off Fresno right-hander Trent Thornton. Angelo Mora smacked a two-run homer in the seventh to put the Dodgers up, 3-2, after Tyler White and AJ Reed hammered solo jacks for the Grizzlies. Mora tacked on an insurance run with a single to center in the ninth, completing a 3-for-4, three-RBI night. Second baseman Kyle Farmer made a potentially game-saving catch with two on and nobody out in the eighth, plucking J.D. Davis' line drive over his head. Brian Schlitter promptly retired Derek Fisher on an inning-ending double play grounder to shortstop.